Aimed at musicians performing live, Shure SE425 promises reference quality audio using its dual high-definition drivers. After two years, it’s still around and a crowd favorite – upstaged only by the more expensive SE535. Why this is so will be explored in this review. “If it ain’t broke, don’t fix it” seems to be Shure’s mantra when it comes to the designs of its earphones. Shure SE425 has retained most, if not all the attributes of its predecessors that make comfort and fit their best selling points. Its highly ergonomic set up ensures that the ear pieces are aligned with your ears – which is ideal for listening to music lying down or on your side. With the metallic silver and clear options, they are unpretentious, but definitely cool. Priced at $299, you are well within your rights to expect a near perfect fit. Shure has aided this by supplying a total of eight pairs of ear sleeves; three pairs each of sizes S, M and L for both hard foam and silicone, and a pair in yellow soft foam and triple-flange tip respectively. The hard foam ones delve in perfectly, and are particularly good at sealing in the music and isolating outside noise. If the sleeves offered fail to accommodate, it’s worth it to order custom made ones. Another gratifying aspect of the SE425 is that the cable is thick and reassuringly Kevlar-reinforced – not something that will break easily. Despite that, they are pretty easy to manipulate since sections of the cable near the ear pieces are outfitted with memory wire. Putting the earphones on over-the-ear will become increasingly fuss-free as the memory wire will have conformed to the shape of your ears. The jack is a little too large, though. Plugging it in properly is difficult, especially if your iPhone or device is in a casing. You have the option of cutting away a little bit of your casing to make way for the jack or let your device go naked. Either way, Shure has to take care of this problem soon. Also included in the box are an earwax cleaning tool, a 1/4” adapter, and a carrying case to store them all in. The smartest move Shure had made for SE425 was probably making the cable detachable. Should anything happen to it or one of the ear pieces, you only have to replace the offending part and not the whole set. Additionally, the cable is connected to the ear pieces via gold-plated MMCX connectors. This allows them to be rotated up to 360 degrees when looking for the right fit, without tangling the cable. Being detachable also has another advantage. The original cable does not come with an in-line remote and microphone. Whilst understandable – IEMs traditionally have no handsfree kit – it’s a sad fact nonetheless. A CBL-M+-K cable for music control and microphone can be purchased at Amazon (for about $45 – $50) to replace the original one. That’s one issue solved. Like its brethren SE420, SE425 provides a faithful reproduction of sound. Everything is as accurate as it could be, making you feel gleeful as you listen again to nuances of your favorite songs that you haven’t heard before. However, low-bit music sound noticeably choppy – the earphones just transmits what goes through it after all. Do yourself a favor and get high-bits so that your favorite music doesn’t suffer. Booming bass is not Shure’s signature offering. The bass it gives out is conspicuously flat, but is this necessarily a bad thing? It doesn’t overwhelm the overall sound and still makes instruments like kick drums and bass guitars come off beautifully separate. It will benefit from some amping, though. The mid-range is the highlight of this IEM – as with all other Shure earphones. Vocals are positioned to the fore and don’t clash with other elements in this frequency range. The propagation of high-end notes is wonderful as well. The vein of detail running from the midrange continues upwards, allowing a remarkable amount of separation. Soundstage-wise, there are no complaints as there is a sense of space and depth that is more than adequate. The other notch on SE425’s belt is noise-isolation. 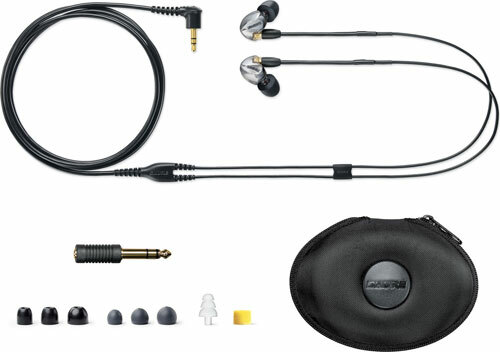 As a pair of earphones it performs extensively better than any over-ear headphones out there, maybe even Bose’s QuietComfort 3. It’s logical to consider this as a possible companion for all your air travels. 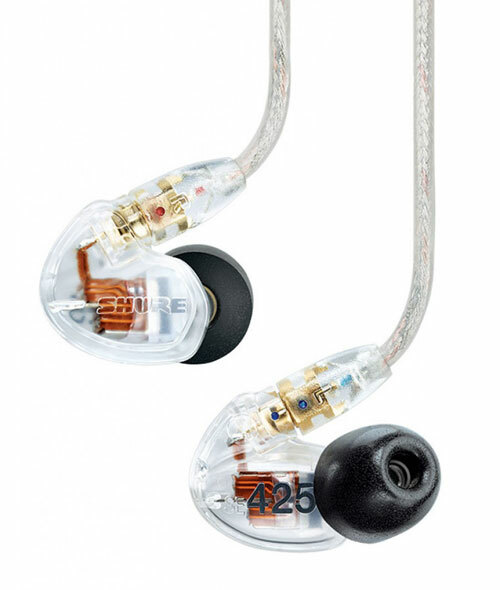 Design-wise, the Shure SE425 will win any audiophile’s heart. Hugely comfortably and easy to put on, this justifies half of its $299 price tag. The other half derived from its audio quality does not go to waste as well. Although it could probably do with a little more bass, there does no doubt that the SE425 is the best value for money in this price range.